Beck, the most elusive of alt-rock heroes, has also charted his generation's most eclectic trajectory. Where other '90s survivors have settled into roles as nascent elder statesmen (Pearl Jam) or rigorous outsiders (Radiohead), Beck walks a pocked and mysterious path. Since busting out of the underground 14 years ago with the slacker anthem "Loser," he's mastered postmodern pastiche, proved a sure-handed surrealist, tripped through tropicalia, channeled a funk-fried party maven, and accessed his inner troubadour. He alternates dazzling-mess albums and focused meditations the way other people change shirts. Along the way, Beck's bottomless stores of hipster irony and wacked-out humor have been largely replaced by dark memory and bleak anticipation. His last album, 2006's "The Information," was a glum, if artful, collection of tech-age fever dreams. "Modern Guilt," as the title of Beck's new album suggests, takes its predecessor's sounds and concerns into the realm of the emotions, douses them with a shimmering dollop of '60s vibes, and voila: another great Beck record. Out today, "Modern Guilt" was co-produced by Brian "Danger Mouse" Burton, half of Gnarls Barkley, and the collaboration makes all kinds of sense. Both are obsessed with the hybrid possibilities of modern technology and classic songcraft - Beck's pioneering patchworks surely paved the way for Gnarls Barkley's tricked-out psychedelic soul - and for Beck's eighth album, the pair has constructed a dazzling set of collisions that are as heady as they are humane. The title track is a diseased ditty, jaunty of step and desperate of message. 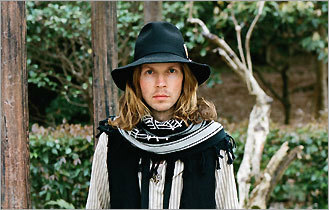 "Misapprehension is turning into convention/ Don't know what I've done, but I feel ashamed," Beck sings over fuzzy beats and saloon-style piano. His anxiety is all-purpose: environmental ("Gamma Ray" and "Chemtrails"), existential ("Soul of a Man," "Volcano"), and social ("Orphans," "Youthless"). Sonic touchstones are equally pointed and vast, from heavy metal and the Beatles to shoegaze and Kraftwerk. In signature form, Beck fashions a fantastical escape on "Replica," an unmoored song that careens headlong into the ether on a rush of skittering beats, ethereal keyboards, and a massive pile-up of basses and marimbas. "Make a perfect replica of your life," he sings above the din. "Cut the paper with exacto knife/ Tape it up/ Tape it up/ Against the howling wind/ I'm so tired I don't know where to begin." While the artist and producer handle most of the instruments, and Danger Mouse's pawprints are nearly everywhere, the best song on the album - lo and behold the first single - is beat-less and Mouse-less. Masterfully cobbled by familiar Beck cohorts Jason Falkner, Joey Waronker, and Greg Kurstin, "Chemtrails" is actually far too eerie and epic to fly as a single, but it does rank among Beck's most beautiful recordings. Sweeping, uneasy, and heartbreakingly lovely, it sounds like Pink Floyd, Brian Wilson, the Flaming Lips, and Portishead hooked up for a one-off. For real-life star power, Chan Marshall, a.k.a. Cat Power, sings harmonies on two tracks, but her contribution is so superfluous you wouldn't know she was there if you didn't read the liner notes. No matter. With 10 songs clocking in at just 33 minutes, "Modern Guilt" feels fleeting, even temporal, and that seems to be the point. It's destined to be an artifact of an age that's rocketing, Beck suspects, toward oblivion. Joan Anderman can be reached at anderman@globe.com. For more on music, go to boston.com/ae/music/blog. Audio Music video of "Loser"